With her grant, Nina will be purchasing the Yamaha LC2 Plus Lab to accommodate 8 students plus one teacher. We admire Nina for bringing music to underprivileged children. Nina had received an email through us last week from former student Scott Lairson which said... "Hi there, I would like to send a message to Nina. If it hadn't been for Nina, I wouldn't be able to sing! I was a voice student of hers for a lot of years in OHIO. She was the most influential person musically and personally in my life. She will ALWAYS be in my heart! I continue to sing to this day in church and different functions. Being a professional chef, I sometimes sing to my clients. If Nina hadn't taught me how to sing and how to keep a song in my heart, I don't know if I would have made it in this life some days. Please tell her I love her and am so very proud of her for still giving back to so many people!" Well we forwarded it to Nina, who contacted Scott and had this to say... "Hi Damon. I just wanted to thank you for forwarding Scott Lairson's email. What a complete joy reconnecting with him! You and Jenny Jones have brought so many joys our way. Thank you! We are ready to open our ninth piano lab. We have a waiting list for adults and one for children. Can you believe in such a short time we are serving 64 children and adults! May God continue to bless you for your wonderful work." Piano classes start in just three days! 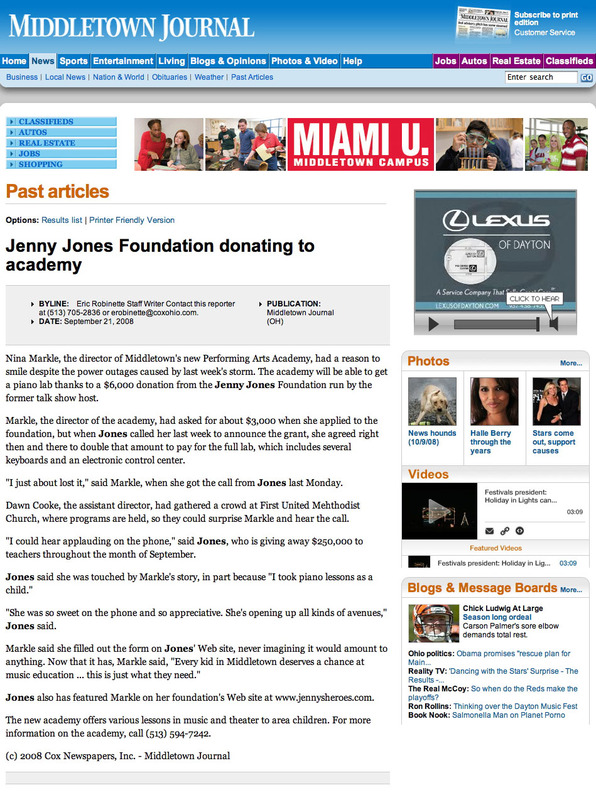 (on January 15th)... Below is the article that appeared in the Middletown Journal today. Nina tells me that a few days before I called, a very lovely lady who retired after 60 years of piano teaching, gave the Academy ALL of her music. Now the children will not have to buy books! Nina got quite a surprise today when I called to tell her about her grant. 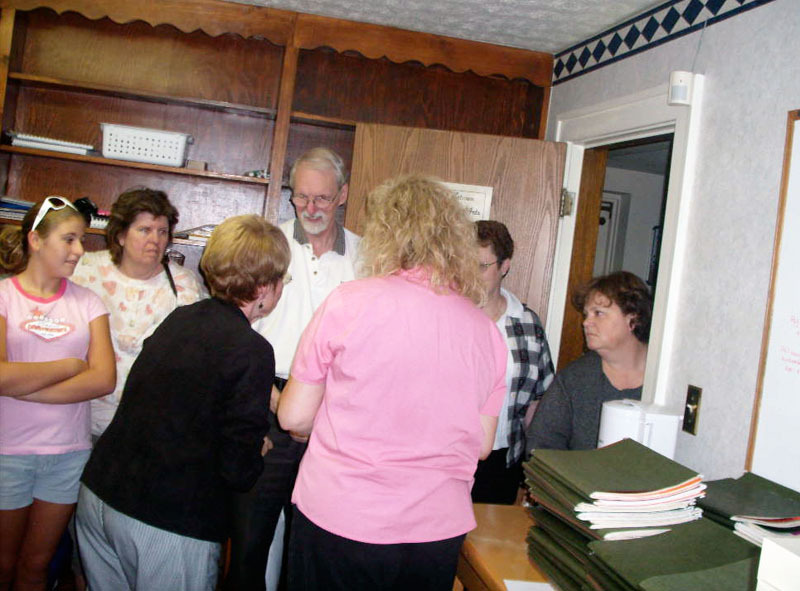 The Academy’s Assistant Director, Dawn Cooke, assembled quite a crowd of 15 to 20 people who were hiding in the sanctuary of the church getting ready to surprise Nina. Then, when everyone was in place and she walked in, I was already on the speakerphone. When I gave her the good news, I could hear everyone applauding in the room. When I asked Nina to explain how the keyboard works, I realized they still needed 8 additional keyboards for the students which would have cost an additional $3,000. I asked her why she didn’t ask for more and she said, “I didn’t want to be greedy.” So I doubled the grant on the spot to another round of cheers and applause in the room. I told her she had to have the whole package. It was so much fun to talk to Nina and she was very happy. I also told her that I took piano lessons as a child and I was kind of mean to my teacher so I felt doubly good about this grant. Plus, she is right about the value of learning music. Because of my knowledge of piano, I was able to write the theme song to my own talk show. 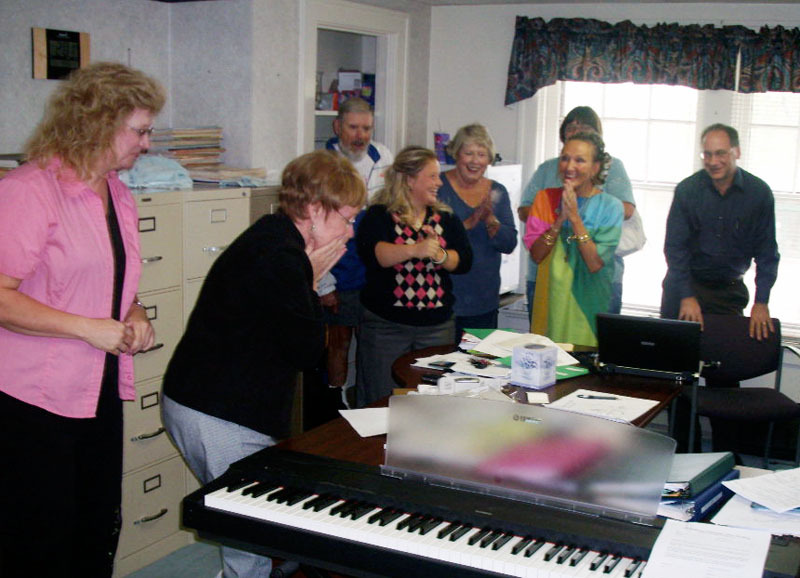 9/15/08: Jenny & Damon wrote... "Congratulations on becoming a part of our special Teachers' Month and for realizing the importance of music and the arts for children." 9/27/08: Imogene wrote... "Nina, you are working so hard to establish your dream of a Middletown Performing Arts Academy. 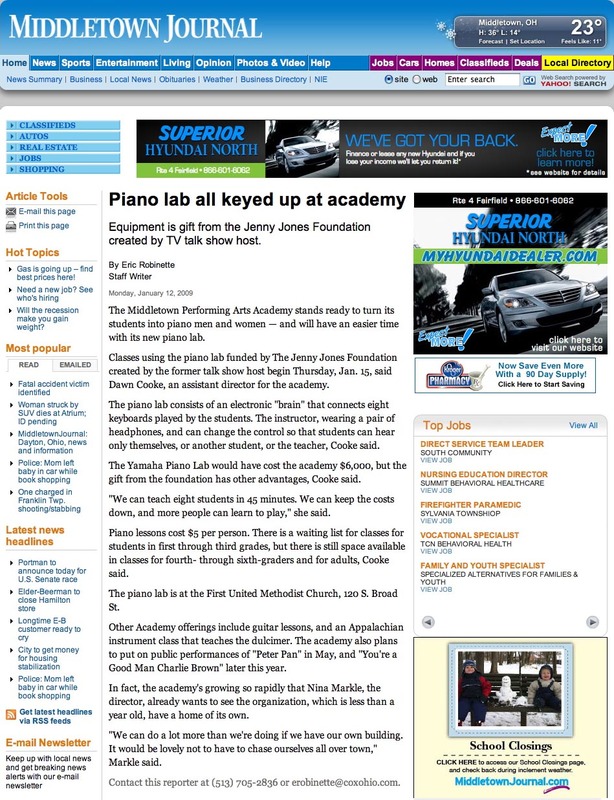 Congratulations on receiving the funding for a piano lab!. This will offer another musical advantage to our area children and adults. The academy is filling a void in our community when funding for Fine Arts in the public schools seems to be slipping away. Keep up the good work!!" 9/27/08: Martha wrote... "Hi Nina, so God never quits. He keeps giving as we do. Dreams do come true when we wish upon a star. Or how ever you want to look at it. You never retired when you left the school, you kept on giving. Some times it is given back. Congratulations girl. Keep up the good work, keep touching people lives through music and Give it all back to the the Lord." 9/27/08: Jess Wilson wrote... "Congratulations Nina! 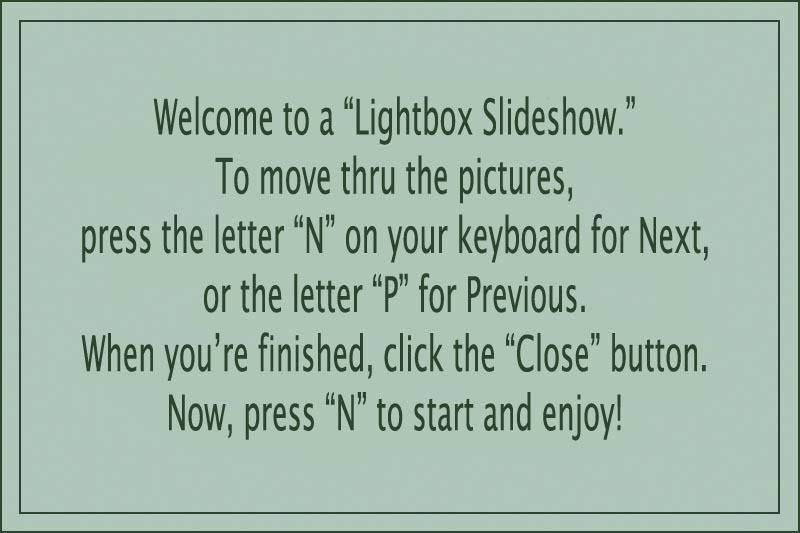 You never cease to amaze us. Thank you for all you have done, and all that you continue to do." 9/28/08: Jon & Angie wrote... "Nina, there is not a "hero" more deserving of this grant! We are so excited for you and all those who so faithfully contribute to your ministry with your endless hours of enthusiasm and dedication. We know the community and those surrounding you will be blessed by the talents and gifts God has given you and your willingness to share them. We know our kids are proud to have had the opportunity to be a part of your summer community theatres. We know you are just the person God would have to lead such a wonderful academy in this area. 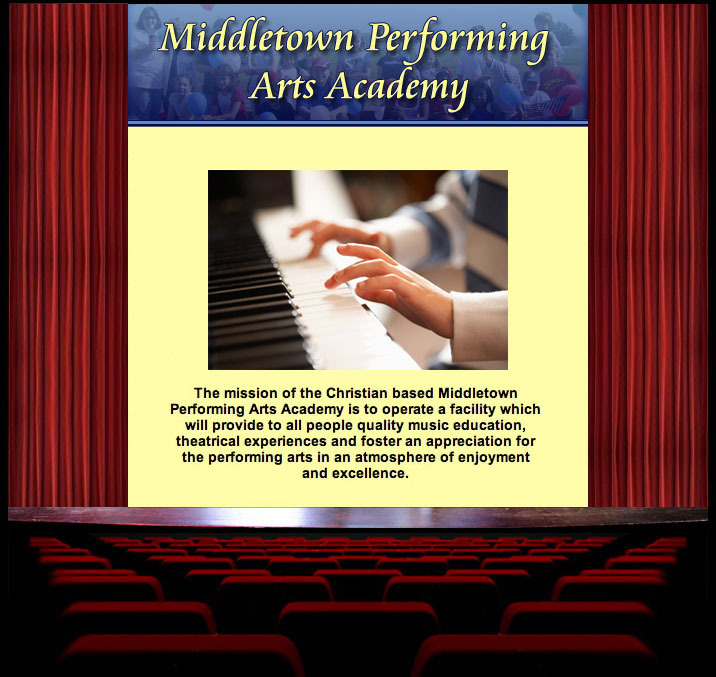 We wish you all the best and congratulations on this grant that will help bring to fruition the wonderful things we know God has in store for your vision in the performing arts!" 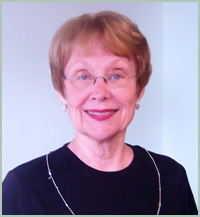 9/29/08: Yolanda Cooper wrote... "Hi Nina~ I just read the information re: the grant received for the piano lab~ I was so impressed when I met you for the first time last week when I brought my little guy in for Kindermusik. As I told you I am new to the area but feel really good about what you all are doing with our kids. 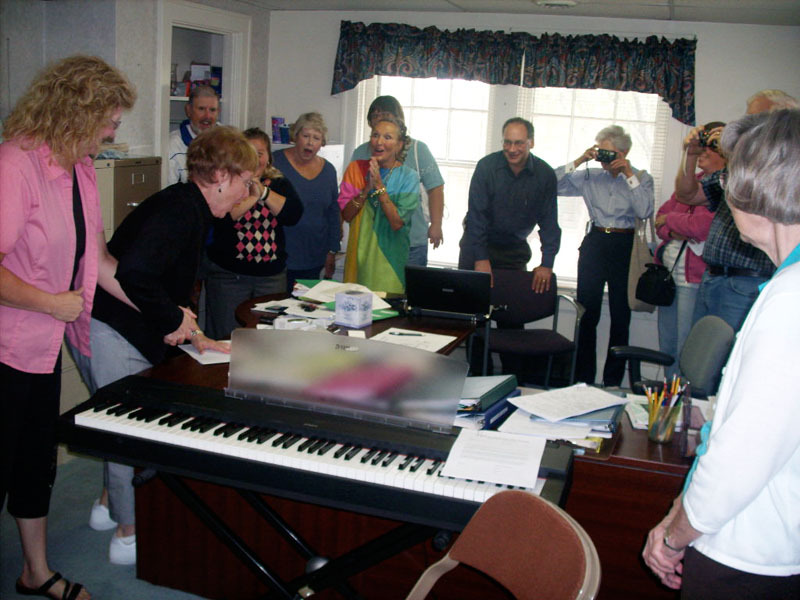 May God continue to bless your vision~"
9/29/08: Dawn Beals wrote... "Dawn Cooke told me the news last week about the piano lab and grant. I am SOOO thrilled. 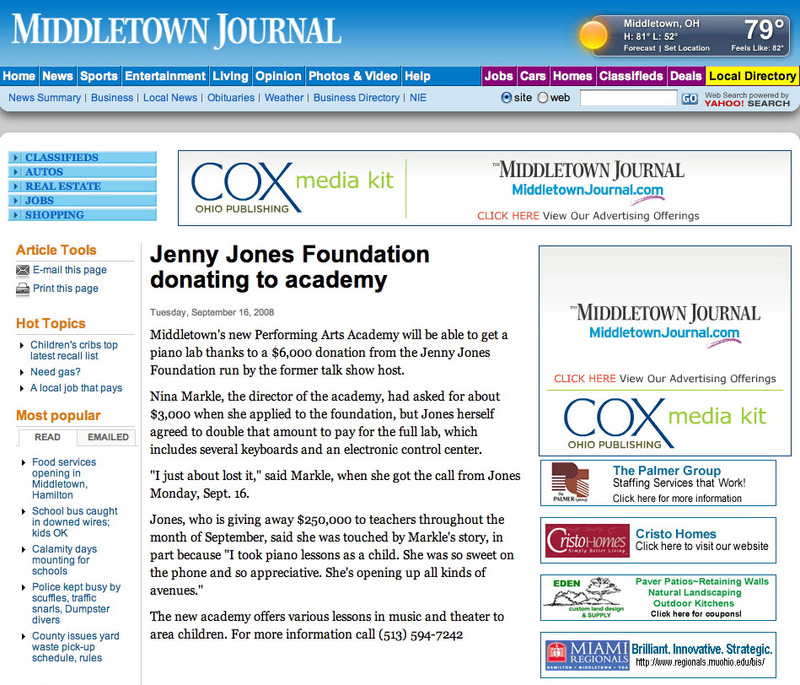 I read the Middletown Journal and Jenny’s Heroes page for all the details. This is awesome and I’m so happy you are in our community. Thank God for Nina and for your visions and dreams." 3/19/09: Scott Lairson wrote... "Hi there, I would like to send a message to Nina. If it hadn't been for Nina, I wouldn't be able to sing! I was a voice student of hers for a lot of years in OHIO. She was the most influential person musically and personally in my life. She will ALWAYS be in my heart! I continue to sing to this day in church and different functions. Being a professional chef, I sometimes sing to my clients. If Nina hadn't taught me how to sing and how to keep a song in my heart, I don't know if I would have made it in this life some days. Please tell her I love her and am so very proud of her for still giving back to so many people!"